This year we planted our first garden and we jumped the gun a little. We planted before we fenced the garden! I would not recommend planting before fencing, but we try and go with the flow. This was our first experience with fencing and I admit that we felt a bit daunted by the task at hand. We had some help getting started, but Patrick and I quickly learned how to build a fence and installed most of the garden fence just the two of us. It really was not that hard. In fact, I think that we've decided to fence the whole property ourselves, when time and money permit and there are some extra hands to help out. The first steps in fencing our garden were to select straight and sturdy wood posts for the corners and to dig the post holes. 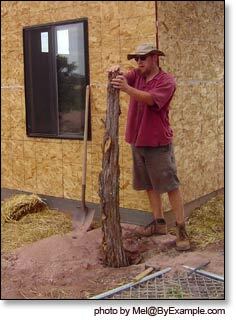 We used juniper logs that are readily available from the trees in our area. With plans for a 4' fence we selected the straightest branches that were 6' or more. 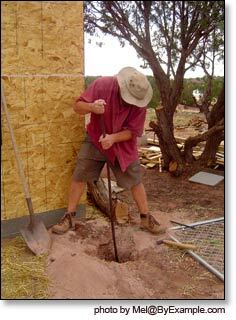 Using a digging bar we made holes for the wooden posts that were at least one foot deep and sometimes deeper. 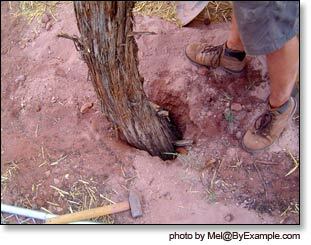 When making the holes, each one was sized to pole that was to be used and was made as tight a fit as possible. After placing each post in its hole we filled the gaps with dirt, leaving an indentation around each pole. One at a time we filled the indentations with water and then left them to sit for about 15 minutes. 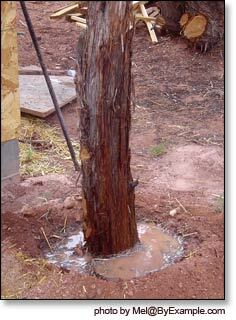 When it was obvious that the water had absorbed into the dirt around a post we stomped on it until the earth was firm. We continued to add more dirt around each of the posts, moving the posts back and forth as needed. We kept packing and stomping until all of the posts seemed solid and barely wiggled when pushed. Next we placed 5' t-posts at approximately 7' intervals between the corner posts. We drove them into the ground using a t-post driver. 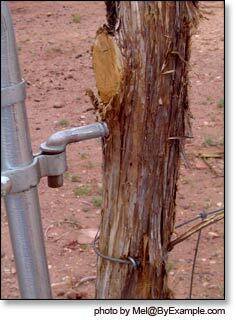 The intermediate fence posts add stability to the fence, but are easier to install than the corner posts. The next step was to stretch 3' hog wire between the corner posts. 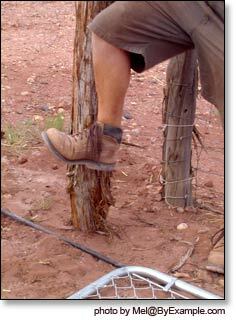 First, we attached the hog wire to one of the posts using large fencing staples. Then we stretched the fencing as tight as possible and secured it by hammering staples into the next corner post. In some places we had to level the ground in order to get the fencing stretched taught. 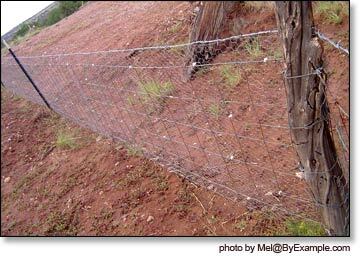 We secured the hog wire to the intermediate fence posts with tie wire -- always in three or more places and always on the very bottom of the fence. 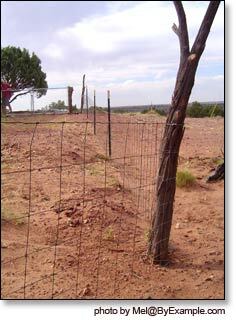 About 6" above the hog wire we stretched and secured barbed wire to the fence posts. 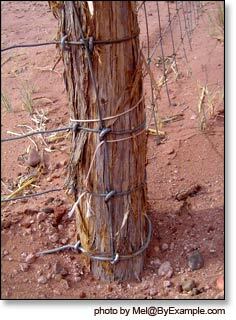 Using a hammer, we secured the barbed wire the the corner fence posts with large staples. We secured the barbed wire to the intermediate posts using tie wire. Another 6" above the first strand of barbed wire we will be installing a second strand of barbed wire. The barbed wire is intended to keep out dogs and cows primarily. 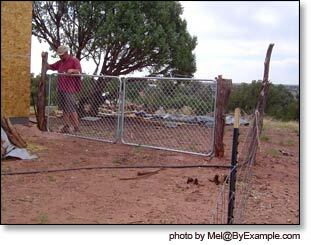 We also installed a line of 4' chicken wire with the fence to deter rabbits, rats and other small critters from entering the garden. We dug a 6" deep trench around the exterior of the fence. We lined the bottom and one side of the trench with chicken wire and then extended the chicken wire up to the first strand of barbed wire. We secured the chicken wire to the hog wire and the posts wherever it seemed necessary using tie wire and plastic zip ties. We extended the fence into the trench as way to deter critters from digging under the fence into the garden. Last but not least, we installed garden gates. 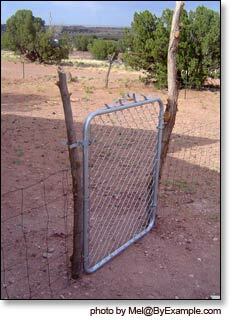 I recommend purchasing or making gates before installing the fence...so that you know how wide the gate openings need to be when installing the fence posts. We purchased chain link gates from the store even though Patrick thought he could build his own. We've been feeling a little pressed for time and short cuts are good when available. It was a little tricky to align the gates on the organic juniper posts, but we made it work. We have two gates for foot traffic and one double gate that is large enough for a vehicle to enter the garden area to make a delivery. Click here to read more about our raised garden beds.